Fixes to the Borderless Windowed mode forcing behaviour, which should greatly increase compatibility of that setting (and hopefully not break it in anything it already worked with!). A new “performance tracing” feature which I used in an upcoming article for PC Gamer, and which I’ll describe a bit more below. The first 3 lines give general information, including the total frames measured, total duration in milliseconds and average FPS over that duration. 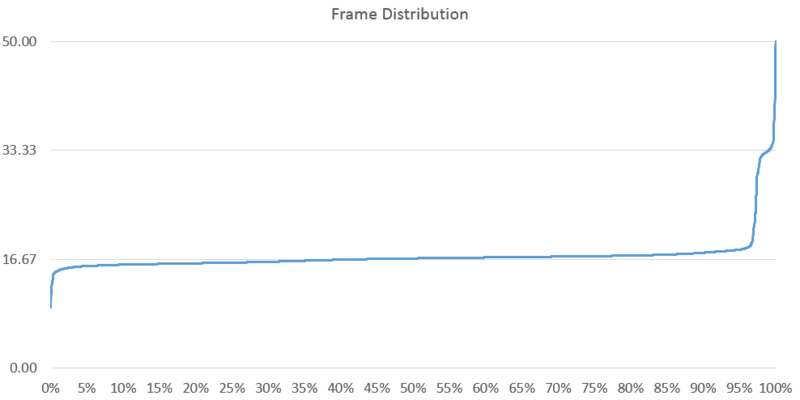 The following 3 lines give 99, 95 and 75 percentile effective frame times. These give you a quick idea of the overall smoothness of a game. I realize that tools doing something very similar already exist, but they may not report all the information, or not be open source, or not be compatible with GeDoSaTo, so I integrated the functionality. The Dark Souls Steamworks migration update is now live. As I expected, most DSfix functionality I implemented (which is based on API call interception) remains operational, but the framerate unlocking (based on binary hooks) does not work with the new version. This part was implemented by Nwks, so we should hope that he is still around and interested in updating it for the latest version. If not, I can try, but it lies outside my expertise and could potentially take a lot of time (which I’d rather spend on other projects). Of course, there’s also the chance for anyone else to step in, as all the code is available on github. For now, you can use DSfix with the new version as long as you disable the framerate unlocking feature in the .ini file. This entry was posted in Uncategorized and tagged benchmarking, dsfix, gedosato by petert. Bookmark the permalink. hi there, i tried to get the new blazblue game to run with your tool, because the menus are with visible pixels and it wanted to downsample and also use the anisotropic filtering that did just great on ffxiii. you have any suggestions or maybe a tutorial for adding custom games to the whitelist as it seems that i dont get it how it works.. i put the exe name in the whitelist and created a config for it and run the game with the tool running.. but there is no overlay as in ffxiii so im confused and i think it doesnt work.. any suggestions? Alternatively figure out a way to implement an option that blocks the game from recognizing Direct Input devices. Is there any chance you can implement support for HBAO+ if it isn’t a passive thing? (ie: If it supersedes HBAO in programs that originally supported HBAO without the developer having to do anything, just let me know otherwise I’d like to make a feature request to support it).